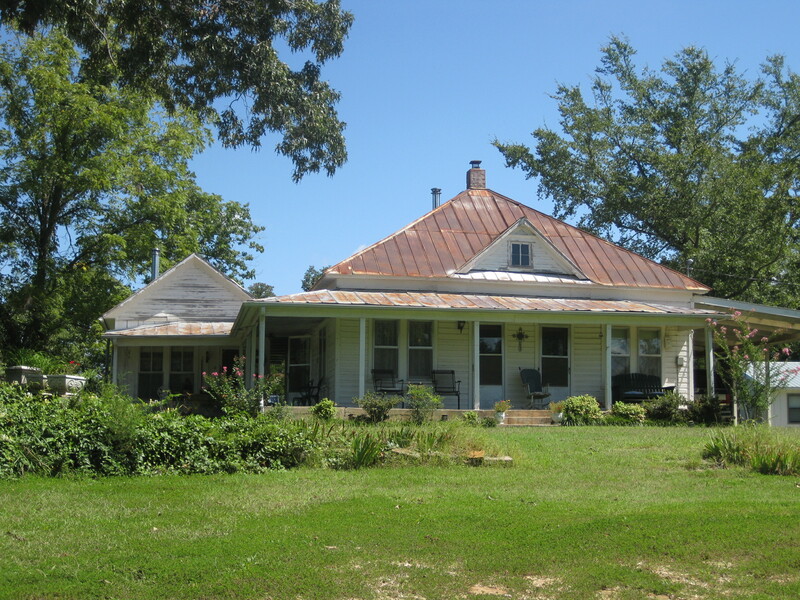 This fine farmstead near Snowball, Arkansas, looks like the kind of place where I’d like to spend several years– if I had a high-speed internet connection so that I could make a living. My reference book, A Field Guide to American Houses, by Virginia and Lee McAlester, indicates that the pyramid hipped roof, in contrast to the hipped roof with ridges, can be found in styles called National and Folk Victorian. The main roof consists of four triangles of equal size, which means that the house is square. Sometimes this type of house is called a “hipped box,” for that reason. The dormer lets light into the attic. The two front doors are common in houses of the last half of the 19th century, and there is a lot of speculation about why. My guess is that the front porch of a small house serves the same purpose as a hallway or split foyer in a larger house. I grew up in a couple of houses with two front doors and learned from my father that having an extra front door takes the urgency out of fixing a door knob. Visitors were confused: they rang the bell on one door and somebody opened the other. My mother quit baking pies in protest, and finally a screw was found to replace the stripped one that held the knob. Two front doors helps with maintaining the symmetry of a square house. A single front door couldn’t be centered, since there’s usually a load-bearing wall in the center of a square house. So two doors keeps a visual balance. Houses of this general structure were built all over the United States between the Civil War and 1940. There are a bunch of them in the old residential parts of Springfield, west of the square as well as north of Kearney in the central part of town. Snowball is in Searcy County, not far south of the Buffalo River, just west of US 65. Jimmy Driftwood, the folksinger and songwriter (whose songs “Tennessee Stud” and “Battle of New Orleans” were big radio hits in the 1950s for Eddy Arnold and Johnny Horton, covered countless times by others) was born in Snowball, Arkansas and in Mountain View, Arkansas, according to successive sentences in his Wikipedia entry. His name when he was born was James Corbitt Morris, and Jimmy is also spelled Jimmie. Now this two-door thing is beginning to make sense. We live in one of those two-front-door houses. The second, rarely-used door lines up with the steep stairs going to the two rooms upstairs. Nothing very tall or long could make the turn at the door from the living room into the small area at the foot of the stairs. Thanks, Gene, for your insight into the reason for double doors. I remember seeing the first edition of your book “How to Find Your Ideal Country Home” many years ago and realizing that I could not improve on it. I would encourage anyone who can afford it to buy the printed version, even though Gene, through the above link offers a free look. This house belongs to my grandparents, I can describe every detail of the house inside and out. This is my favorite place to visit. Wow, Kaleb. How nice to have this house to visit! I’ve lived in a few houses with two front doors. They lead to endless speculation about their purpose. Hey I can’t believe I found this! This is my grandparents place! whats up cousin kayleb! It’s so beautiful there and very close to the Buffalo. Great Aunt n Uncle lived in Ozark in the 1950’s. Had a farm where Home, Barn, sheep shed, and well house all made of native stone. and near barn there was a very large round concrete watering trough that had two very large orange koi. The home had hardwood floors, and the living room had a large picture window.Upstairs attic was partially finished for sleeping quarters for young guests. Was too young to remember way there, and parents are gone and have no address for that farm. Does anyone know where that is? Would it be for sale? Please let me know.Their names were Lawrence and Eva Allen. This is my grandparents house also. I love spending time there. I would love to live there someday.